I was asked this question. “How would you convince 90 engineers to incorporate accessibility in with design and development?” I had to admit that despite the ideas popping into my mind, I didn’t have an answer I liked. The question nagged at me. Everyone, unless they are already trained, certified or working in the internet accessibility field, has a limited understanding of what web accessibility is. We learn differently. What would make the most impact on 90 engineers? I am the daughter of an electronics engineer. His career began with Philco, during the time of radio and black and white tube TV sets. He is the smartest person I know. Early on I learned to not ask questions, (“You won’t understand the answer”) and to be prepared for all discussions on the topics of politics, the nature of reality, math and computer science, because he was always right and we (being everyone the planet) were wrong. One day he showed me one of his many inventions (later patented by the companies he worked for). It was probably around 1974, during the days where hand calculators were the size of today’s computer tablets. He took the inside parts of the calculator and made a light meter for a camera. It probably did more than that, but I was a dipsy teenager and all I remember was that my Dad could dissect a calculator and make something else with it. He also built my stereo and gave me my first computer. 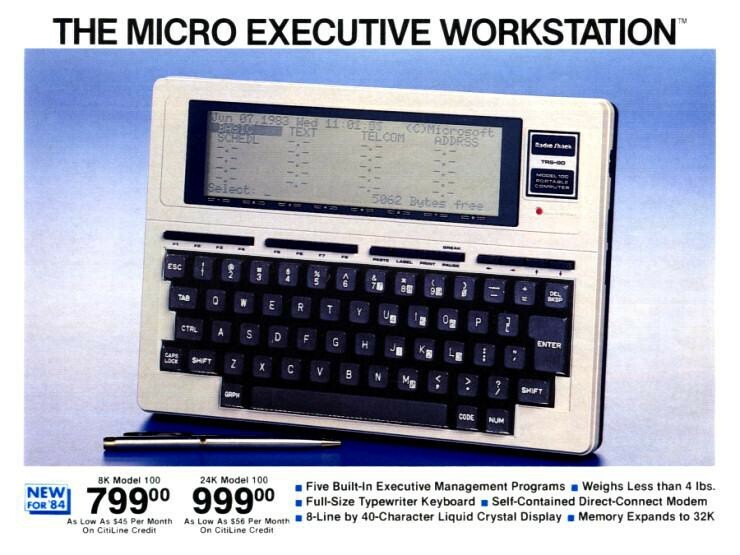 It was a Radio Shack TRS-80 Model 100. His instructions were simple. “Learn this.” I had no idea what to do with it. “It’s all logic,” he said. True knowing is experienced. The best experiences make an impact. For accessibility we can’t be expected to “learn this” by direct experience with every type of disability, permanent or temporary. Rather than expect engineers to be empathic, which in my experience is not nearly as important to them as the geometry of the universe, we can demonstrate logic. This is how I learned how cool JAWS is. A friend of mine was speaking at a search engine strategies conference years ago during the days where many organic SEO methods included keyword stuffing and hidden redundant text in an effort to communicate to search engines what the page was about. My friend brought JAWS up on stage with him and held it up to the microphone so that the audience of several hundred designers could hear what their SEO practices sounded like with an assistive device such as JAWS. Despite the giggles as the robotic voice repeated keywords and key phrases over and over, his message was immediately clear. It was cruel what SEO’s were doing to a specific target market of people. Their only goal was to get a page to rank or be indexed, but there was no consideration for the human user who found it in a search engine. This practice still exists but has decreased over the years thankfully. It is not common to find a digital marketing company testing client website properties with screen readers. Nor is it common for most companies to incorporate accessibility testing of any kind into their design and development methodologies. My genius dad, the electronics engineer who hates “Win-doze” and during one visit, asked me to test an app that figures out how dice will roll (or something like that), is also naturally curious. Quick with a rebuttal or factoid, he has learned (thankfully, by the grace of time), to wait and watch how something works before he makes it better. I realized that convincing 90 engineers to incorporate accessibility into design and development would be no more difficult than convincing my dad of anything. I could pass around blindfolds and computer devices loaded with screen reader apps, or web pages with juggled up letters that dyslexic people see, or fonts and colors with emulators to demonstrate what colorblind people experience and what it’s like to go outside in the sunlight or forget your reading glasses. There are all kinds of ways to demonstrate computer based responses for humans who arrive to our web pages and internet applications, content, buttons, forms, barcode scanners, bank card swipers, all the things we use and do and when we suddenly are unable to, what happens? “Learn this,” I would say to those 90 engineers.